We've had a great time in Seattle and I think we've done a pretty good job of both sightseeing and trying new beers. The beer and house-made sausage platter at Collins Pub was awesome. Its great place just a block off Pioneer Square where we took the Underground Tour. 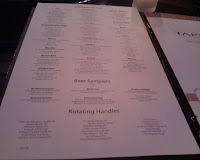 After having sushi for dinner, we stopped off at Tap House Grill which has 160+ beer on tap. Our server appeared to be quite knowledgeable about the beer they carried and did a good job of providing details and helping with selection. When faced with that may different beers in one placed that I wanted to try, I was glad they have a build-your-own sample tray option. Although, even then it was hard to narrow it down. Today was more sightseeing which included a stop at one of the Elysian Brewpubs. They've always been one of my favourite brewpubs and bombers of their beer to-go were only $3 (I could barely keep myself from filling the trunk of the rental car). Tonight is our last night in Seattle before heading down to Portland and even more great beer.